For my first taste of this thick and creamy yoghurt, I added a teaspoon full of thick honey and a spoon full of strawberry preserves. The preserves came from a selection of jams and preserves that appeared to be made in-house. Chunky, irregularly cut marmalades, cherry preserves abundant with deep red/burgundy fruit, a nice consistency to both the strawberry and apricot preserves and more. I tasted just one spoon full of yoghurt with a touch of honey and I must have literally groaned. Yes, it was that good. Greek yoghurt differs from pre-packaged yoghurts in North America and elsewhere (including the Philippines) in that it typically has up to three times (3x!) more butterfat than its wimpy cousins. Made from both sheep’s milk (lower fat) and cow’s milk, the creamiest Greek yoghurts can have up to 10% butterfat. That’s why it is so creamy, so luscious, with just a touch of sourness, but really more like eating good unsweetened whipped cream. After a small bowl of yoghurt, I had a heaping plate full of scrambled eggs, sausages, ham and pan-fried potatoes with ketchup, of course. Several glasses of freshly squeezed greek orange juice (they had this machine that would continuously cut and squeeze oranges as required), a cup of hot tea and we were definitely on our way to being totally fortified for the day. 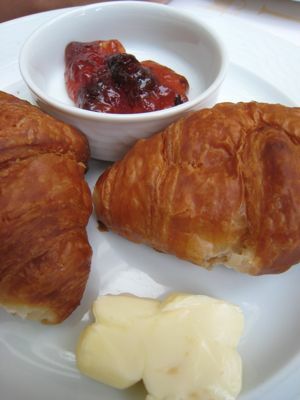 But how could I resist two warm croissants, with sweet butter and more of the delicious strawberry preserves? And for “dessert”? 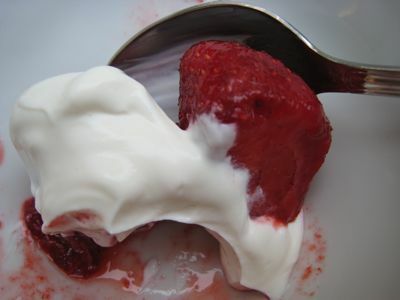 Of course a bowl of incredibly ripe and luscious strawberries with more of that spectacular greek yoghurt. Yum. And we had 6 more days to explore everything the buffet had to offer… But one thing was absolutely consistent at breakfast during our entire stay in Athens… a bowl of delicious greek yoghurt. 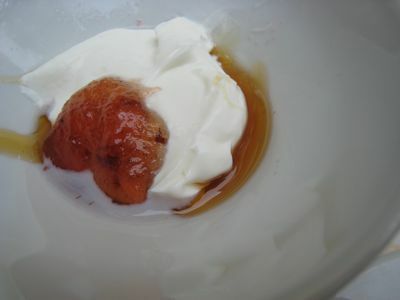 If you are curious, and want to make your own greek yoghurt, this link makes it sound easy. And here’s another trick you might try – take some good store bought plain yoghurt and stick it in some dense cacha or muslin and let it hang over the sink or a large bowl for a couple of hours to drain/extract some of the water content. The resulting yoghurt will be thicker and more similar to greek yoghurt, but still not as creamy and rich due to the difference in butterfat. Greek yoghurt is sublime. Also check out this concoction I once tried with homemade guava jelly and greek style yoghurt… now I know why the combination naturally felt so right! Woooow! I never ever liked any yogurt, but this one is so endearing. I hope there’s something like that here in Abu Dhabi. Can’t wait to hear more of your Grecian adventure. That 10% BF Greek yogurt sounds almost like the crÃ¨me fraÃ®che thatâ€™s available in Europe particularly in France and Switzerland where it is also served for breakfast as a soaking medium for muslix. There is no looking back once you taste this cereal killer. 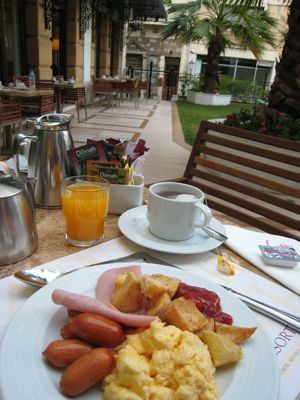 Your breafast looks so good, yogurt and preserves, sausage and eggs, croissants, fresh squeezed orange juice,,,you cant for anything more. What’s the name of this place you’re staying? Who knows, maybe when I go to Athens, Ill check in at the same place! Does anybody know where to get crÃ¨me fraÃ®che in Manila? Greek yogurt drizzled with honey and sprinkled with fresh pistachios… Greek yogurt spooned over granola…Greek yougurt with chopped dates and slivered almonds…. Greek yogurt in a fresh fruit parfait… Greek yogurt in tzaziki… Greek yogurt in frosting… Greek yogurt ice cream… Can you tell I like greek yogurt? greek yogurt—hmmm–got to try that. 3x the butterfat!! will surely head to the greek-markets nearby. that’s what makes it so tasty..lots of butterfat. fat-free stuff taste just like that—fat-free. I always enjoy reading your blog, but I have a suggestion. I would really love to read a series of articles on the various traditional rice varieties of the Philippines. I’m not a marketer of native rice or anything. Actually, I work for a media outfit, and this suggestion comes out of an experience I had recently whiel shooting a story about the rice crisis in the Cordillera Region. In the town of Hingyon, Ifugao, our local host fed us a lunch of native pork adobo paired with their traditional rice. It’s called ‘tinawon’ and is still hand-planted and organically grown in rice terraces like the ones in Banaue. I must say, I was amazed by the taste, texture and aroma! I eat rice everyday here in Manila, but normally it’s only a bland accompaniment to my main dish. But the tinawon I tasted in Ifugao was delicious enough to be a main course on its own. I finished four servings, whereas I usually can barely finish one! Funny how we city-dwellers eat rice everyday but rarely pay it much attention. We don’t even realize that what we’ve gotten used to eating is an industrialized version of the staple. In reality, there are many varieties to sample savour and explore! Rizal Dairy Farms makes a Greek style yogurt…not as creamy/thick or as rich as the real stuff, but still much better than “supermarket” yogurt! Yogurt with 3x more butterfat! My arteries are rejoycing to your good news! :) This is almost like butter. For a while I thought you were describing butter not yogurt. And to think people say yogurt is healthy because it has a lesser fat content than its other dairy cousins. Guess Greeks don’t believe in such things. Too bad we don’t have any here in the country. The closer I probably got to eating “Greek” yogurt was at Mano’s in Tagaytay. Yummy and heavenly tasting Greek yoghurt…glad you enjoyed such delights. At the end of the day,its the quality of milk that produces such lovely velvety texture. Its one of those tasty things that you’ll never get tired of..and wish was just around the corner for you to simply purchase and consume. Alas, we are not in Greece:( Yet,hopeful in good things to come. Yey! The greek (and hopeully) turkish culinary posts begin! Ay, a good brekfast is the way to my heart too! This looks like it was worth every calorie, carbohydrate and gram of fat! They sell giant tubs of Lemnos greek yoghurt at S &R, probably very different from what you had but as close as we probably can buy here commercially. To the reader who was looking for creme fraiche, S &R sometimes sells small tubs in the freezer section. Its usually near the clotted cream. Either in a blue or brown container. I have also seen it at Terry’s selection, which also, incidentally, has fromage frais every so often. Instead of kacha/muslin, you can also line a colander with coffee filter paper and drain over a bowl in the fridge. Works really well. What motivates you to visit Greece? I felt that Greeks were similar to Filipino people in terms of food culture, meaning it is like eating with the whole bunch of family relatives and enjoy that wonderful atmosphere, Italians too! Of course their food is so much better in terms of seafood prepation and presentation. It is always balanced with their meat and salads. Never been in Greece but I have few Greek friends around. Jerome, you are correct, if Singaporeans are the Asian equivalent of the Swiss, I would buy the comparison that Pinoys are closer to the Italians and Greeks… As for the holiday destination, this year it was chosen by the Kid, who had just finished taking Ancient Greece and the Byzantium Empire in school and wanted to see the actual sites referred to. Learning is so much better when you can see and feel history rather than just reading about it. Of course, I was thrilled to go to either of these destinations as the food and markets are legendary as well! :) Jacob’s Mom, thanks for that tip, I should run out and buy coffee filter paper (I don’t drink coffee). alicia, the lemnos is not bad, we buy that too, but I am curious about making it myself. I always felt that making yoghurt in our temperature and humidity would kill me… but it could get as hot and humid in greece as well… as for the creme fraiche, you are right, it is carried at S&R as well. shalimar, YES, greek yoghurt, honey and mango, superb! Actually, I brought two packages of dried mango, just in case you managed to fly back to Greece when we were there! :) Alexena, they have greek style yoghurt at S&R. Shucks, I should have hoarded some as I suspect they might run out after this post…heeheehee. Joey, I can totally see how this would be a favorite. I wasn’t a HUGE fan of yoghurt when I was younger, but if I had tasted this stuff… ayayay! P, have you bothered to check the archives? I have a few posts on red rice, sticky rices, etc. from way back. You might want to check them out. Not to mention posts on palayok cooked adobo and other shortcut versions that would go well with the rice… with 1,700 posts in the archives, you may find several that would be of interest to you. Myra P., yup, I get it. I am dreaming up additional pairings as I type this… :) Marketfan, yikes, that reminds me, someone once gave us an Easiyo machine… I wonder if we still have it. Chris, creme fraiche at S&R sometimes. Liz, maybe I can do a post on the hotel. Apicio, it is similar to creme fraiche, but CF has EVEN MORE butterfat. I love that too. I’ve loved yogurt for as long as I can remember, but am definitely a convert for thick creamy greek yogurt over the last few years. Drizzled with honey, with nuts, with fruit, with cereal, and I also used it to marinade some chicken recently (I used the Rizal Dairy greekstyle yogurt, thanks to Joey’s recommendation). Amazing how yogurt can make a piece of roast chicken taste so different and keep it moist and yummy. mila, i agree. i’ve tried marinading boneless chicken thighs with yoghurt to make japanese chicken karaage. it’s so moist and tender and tasty! I love greek yogurt with honey. Speaking of which, in Finland, they have this yogurt which is absolutely delicious with fresh berries. What can I say? The yogurt selection in this part of the world is excellent. that’s what i buy here. the greek yogurt. i’m done eating the american yogurt. the greek is far more superior and i love eating it plain with all the tartness it has to offer. love it….just simple goodness and none of those articifial flavorings. I had some french yogurt too made of goats milk and very creamy too, softer than the greek’s consistency. I used to buy greek yoghurt religiously from a small but well stocked greek deli in Sydney where they have a sizable greek population. Topped with fresh apricots, super ripe strawberries, blueberries or honey, sydneysiders would eat them as dessert or a snack while sprawled on the grass at their magnificent parks. Excellent way to end a meal as well! This week I made pizza with roasted chicken,roasted pumpkin with onions,herbs from our garden,feta cheese,drizzle of evoo and served with dollops of greek yoghurt with fresh garlic and my family thought I bought it from a gourmet pizza shop. If you do decide to make yoghurt the traditonal way, I suggest your cast iron Le Creuset casseroles are ideal for retaining heat. The thickness appears to come from the concentration of milk solids, rather than butterfat richness (the creamiest, thickest yoghurts in Australia are 97% fat free) so if you use the milk powder method, adding extra milk powder will make it richer. The traditonal method uses a hay box to maintain the warm temperature, but I just wrap the cassrole in newspapers and place it in a cardboard box. You should see results in about 3 hours though I always leave it overnight. boiling the milk mixture for a while prior to inserting the culture will result in a smoother product. I use a dollop of yoghurt straight from the fridge, in case I have overestimated the heat, the culture will survive by the time the starter warms up in the milk. I have never used a commercial yoghurt maker, and I am sure they produce excellent results as well. I prefer my own yoghurt to any commercial brands available. I hope you atempt this as the process is very satisfying. I really love yoghurt, and it was from Joey’s article in Yummy magazine that I’ve read about Greek Yoghurt..
Just back from HK. They have FAGE yoghurt in City Super, Great and 360. Ate five tubs with honey because of this post! Alicia, thanks, was wondering where to get FAGE in Asia… i was about to tell MM to try FAGE (fa-yeh), they even have one which has honey segregated in a nice little corner of the container… it comes in zero fat, 2% and regular but the 2% tastes as good as the regular, no change in consistency…on my last day in the US, i ate it for breakfast, lunch and dinner… could it survive a trans-pacific and/or Asian flight kaya if you handcarry it? I just want to ask where I can get yogurt starter in the Philippines? I’m here in Baguio. Sorry, I would love to help, but I don’t know where to get yoghurt starter. Thanks for the quick reply. Anyway, I already found out where to get some. Hi Rene, where did you find yogurt starter? Is it in granule form? That’s what I’m looking for. I generally use Nestle yogurt as my starter since it’s most readily available and has live bacteria. Here are the first batch of WINNERS!!! Yahoo!